Ladies just love hair extensions, and the more expensive they are like, Brazilian (human) hair, the more prestigious it makes the wearers feel. It is therefore very important that users of hair extensions are educated on where these hairs really come from. Though some hair extensions come from animals and others are synthetic, a lot of the higher-end hair extensions from companies such as Great Lengths, actually come from religious temples in India. 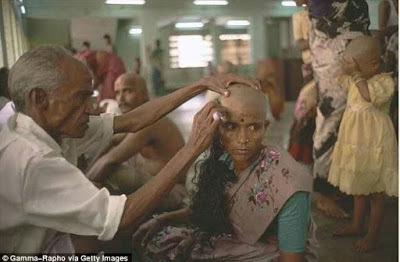 According to the documentary “Hair India,” Hindu pilgrims have donated their hair at holy temples throughout Southern India for centuries in an attempt to purify themselves and repay debt to their Hindu gods. When companies buy hair from the temple for as much as $700 per pound, it contains sweat, blood, and lice. 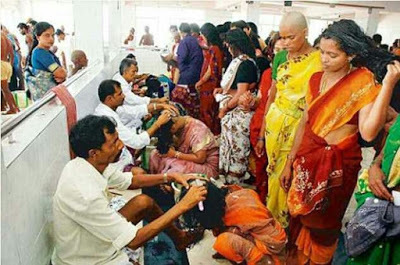 At the temple, some 650 barbers sit in lines on the concrete floor and tie the women’s hair into ponytails before cutting it off. Once the large portions of hair are removed, the barbers use a razor to shave each pilgrims head, before dousing their head with water to wash away any blood. The women don’t know their shaved hair is later sold. A temple in Tirumala made £22million in a single year from the ‘mountains of black gold’ it received from local women. 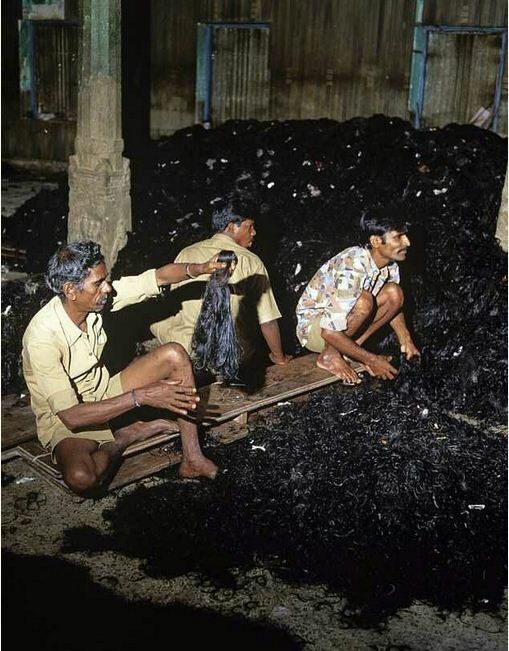 Once hair is collected, bought by companies, it’s transported (rolled up in huge bales like hay) by road and plane to factories, and distributed to workers as many as 350 per site to be processed. There’s a lot of secrecy in the trade. Obtaining hair is not easy, and there’s a risk of it being stolen while in transit.